A. Gyulassy, V. Pascucci, T. Peterka, R. Ross. The Parallel Computation of Morse-Smale Complexes, In Proceedings of the Parallel and Distributed Processing Symposium (IPDPS), pp. 484--495. 2012. Topology-based techniques are useful for multiscale exploration of the feature space of scalar-valued functions, such as those derived from the output of large-scale simulations. The Morse-Smale (MS) complex, in particular, allows robust identification of gradient-based features, and therefore is suitable for analysis tasks in a wide range of application domains. In this paper, we develop a two-stage algorithm to construct the 1-skeleton of the Morse-Smale complex in parallel, the first stage independently computing local features per block and the second stage merging to resolve global features. Our implementation is based on MPI and a distributed-memory architecture. Through a set of scalability studies on the IBM Blue Gene/P supercomputer, we characterize the performance of the algorithm as block sizes, process counts, merging strategy, and levels of topological simplification are varied, for datasets that vary in feature composition and size. We conclude with a strong scaling study using scientific datasets computed by combustion and hydrodynamics simulations. A. Gyulassy, P.-T. Bremer, V. Pascucci. Computing Morse-Smale Complexes with Accurate Geometry, In IEEE Transactions on Visualization and Computer Graphics, Vol. 18, No. 12, pp. 2014--2022. 2012. Topological techniques have proven highly successful in analyzing and visualizing scientific data. As a result, significant efforts have been made to compute structures like the Morse-Smale complex as robustly and efficiently as possible. 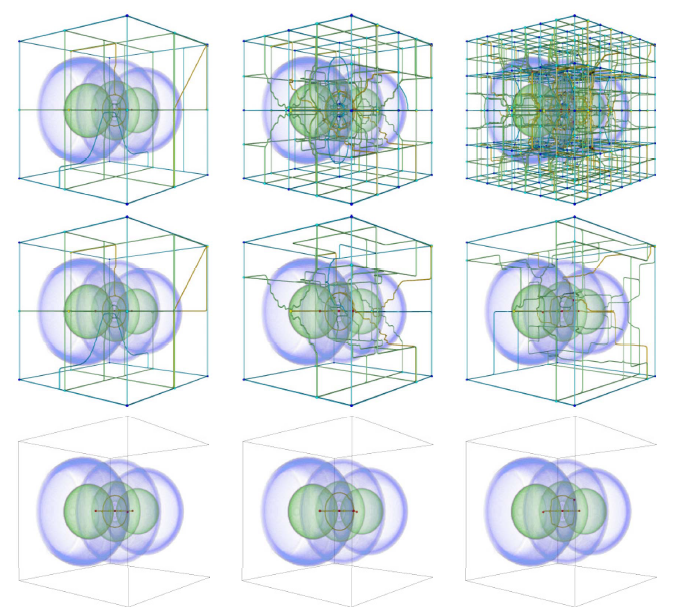 However, the resulting algorithms, while topologically consistent, often produce incorrect connectivity as well as poor geometry. These problems may compromise or even invalidate any subsequent analysis. Moreover, such techniques may fail to improve even when the resolution of the domain mesh is increased, thus producing potentially incorrect results even for highly resolved functions. To address these problems we introduce two new algorithms: (i) a randomized algorithm to compute the discrete gradient of a scalar field that converges under refinement; and (ii) a deterministic variant which directly computes accurate geometry and thus correct connectivity of the MS complex. The first algorithm converges in the sense that on average it produces the correct result and its standard deviation approaches zero with increasing mesh resolution. The second algorithm uses two ordered traversals of the function to integrate the probabilities of the first to extract correct (near optimal) geometry and connectivity. We present an extensive empirical study using both synthetic and real-world data and demonstrates the advantages of our algorithms in comparison with several popular approaches. A. Gyulassy, N. Kotava, M. Kim, C. Hansen, H. Hagen, and V. Pascucci. Direct Feature Visualization Using Morse-Smale Complexes, In IEEE Transactions on Visualization and Computer Graphics, Vol. 18, No. 9, pp. 1549--1562. September, 2012. In this paper, we characterize the range of features that can be extracted from an Morse-Smale complex and describe a unified query language to extract them. We provide a visual dictionary to guide users when defining features in terms of these queries. 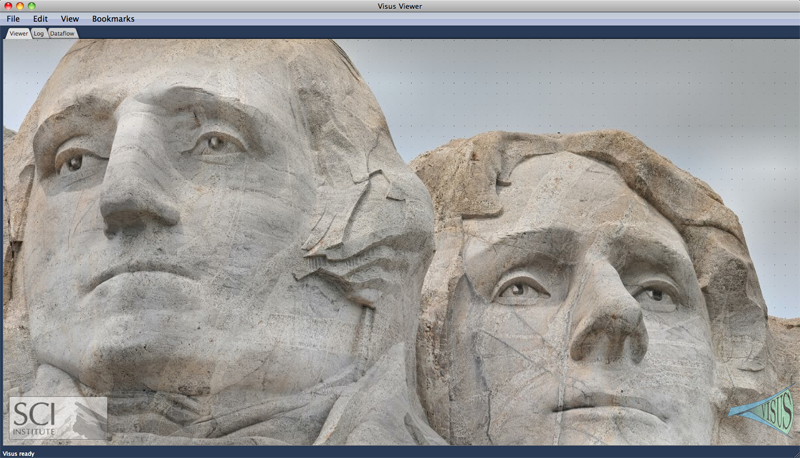 We demonstrate our topology-rich visualization pipeline in a tool that interactively queries the MS complex to extract features at multiple resolutions, assigns rendering attributes, and combines traditional volume visualization with the extracted features. The flexibility and power of this approach is illustrated with examples showing novel features. S. Kumar, V. Vishwanath, P. Carns, J.A. Levine, R. Latham, G. Scorzelli, H. Kolla, R. Grout, R. Ross, M.E. Papka, J. Chen, V. Pascucci. Efficient data restructuring and aggregation for I/O acceleration in PIDX, In Proceedings of the International Conference on High Performance Computing, Networking, Storage and Analysis, IEEE Computer Society Press, pp. 50:1--50:11. 2012. Hierarchical, multiresolution data representations enable interactive analysis and visualization of large-scale simulations. One promising application of these techniques is to store high performance computing simulation output in a hierarchical Z (HZ) ordering that translates data from a Cartesian coordinate scheme to a one-dimensional array ordered by locality at different resolution levels. However, when the dimensions of the simulation data are not an even power of 2, parallel HZ ordering produces sparse memory and network access patterns that inhibit I/O performance. This work presents a new technique for parallel HZ ordering of simulation datasets that restructures simulation data into large (power of 2) blocks to facilitate efficient I/O aggregation. We perform both weak and strong scaling experiments using the S3D combustion application on both Cray-XE6 (65,536 cores) and IBM Blue Gene/P (131,072 cores) platforms. We demonstrate that data can be written in hierarchical, multiresolution format with performance competitive to that of native data-ordering methods. A.G. Landge, J.A. Levine, A. Bhatele, K.E. Isaacs, T. Gamblin, S. Langer, M. Schulz, P.-T. Bremer, V. Pascucci. Visualizing Network Traffic to Understand the Performance of Massively Parallel Simulations, In IEEE Transactions on Visualization and Computer Graphics, Vol. 18, No. 12, IEEE, pp. 2467--2476. Dec, 2012. The performance of massively parallel applications is often heavily impacted by the cost of communication among compute nodes. However, determining how to best use the network is a formidable task, made challenging by the ever increasing size and complexity of modern supercomputers. This paper applies visualization techniques to aid parallel application developers in understanding the network activity by enabling a detailed exploration of the flow of packets through the hardware interconnect. In order to visualize this large and complex data, we employ two linked views of the hardware network. The first is a 2D view, that represents the network structure as one of several simplified planar projections. This view is designed to allow a user to easily identify trends and patterns in the network traffic. The second is a 3D view that augments the 2D view by preserving the physical network topology and providing a context that is familiar to the application developers. Using the massively parallel multi-physics code pF3D as a case study, we demonstrate that our tool provides valuable insight that we use to explain and optimize pF3D’s performance on an IBM Blue Gene/P system. J.A. Levine, S. Jadhav, H. Bhatia, V. Pascucci, P.-T. Bremer. A Quantized Boundary Representation of 2D Flows, In Computer Graphics Forum, Vol. 31, No. 3 Pt. 1, pp. 945--954. June, 2012. Analysis and visualization of complex vector fields remain major challenges when studying large scale simulation of physical phenomena. The primary reason is the gap between the concepts of smooth vector field theory and their computational realization. In practice, researchers must choose between either numerical techniques, with limited or no guarantees on how they preserve fundamental invariants, or discrete techniques which limit the precision at which the vector field can be represented. We propose a new representation of vector fields that combines the advantages of both approaches. In particular, we represent a subset of possible streamlines by storing their paths as they traverse the edges of a triangulation. Using only a finite set of streamlines creates a fully discrete version of a vector field that nevertheless approximates the smooth flow up to a user controlled error bound. The discrete nature of our representation enables us to directly compute and classify analogues of critical points, closed orbits, and other common topological structures. Further, by varying the number of divisions (quantizations) used per edge, we vary the resolution used to represent the field, allowing for controlled precision. This representation is compact in memory and supports standard vector field operations. S. Liu, J.A. Levine, P.-T. Bremer, V. Pascucci. Gaussian Mixture Model Based Volume Visualization, In Proceedings of the IEEE Large-Scale Data Analysis and Visualization Symposium 2012, Note: Received Best Paper Award, pp. 73--77. 2012. Representing uncertainty when creating visualizations is becoming more indispensable to understand and analyze scientific data. Uncertainty may come from different sources, such as, ensembles of experiments or unavoidable information loss when performing data reduction. One natural model to represent uncertainty is to assume that each position in space instead of a single value may take on a distribution of values. In this paper we present a new volume rendering method using per voxel Gaussian mixture models (GMMs) as the input data representation. GMMs are an elegant and compact way to drastically reduce the amount of data stored while still enabling realtime data access and rendering on the GPU. Our renderer offers efficient sampling of the data distribution, generating renderings of the data that flicker at each frame to indicate high variance. We can accumulate samples as well to generate still frames of the data, which preserve additional details in the data as compared to either traditional scalar indicators (such as a mean or a single nearest neighbor down sample) or to fitting the data with only a single Gaussian per voxel. 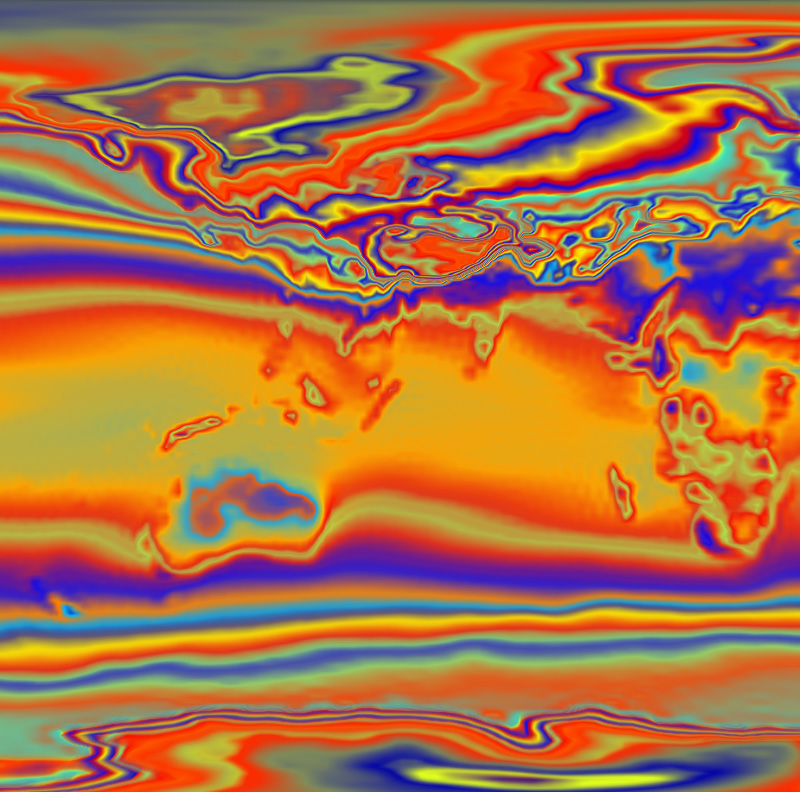 We demonstrate the effectiveness of our method using ensembles of climate simulations and MRI scans as well as the down sampling of large scalar fields as examples. V. Pascucci, G. Scorzelli, B. Summa, P.-T. Bremer, A. Gyulassy, C. Christensen, S. Philip, S. Kumar. The ViSUS Visualization Framework, In High Performance Visualization: Enabling Extreme-Scale Scientific Insight, Chapman and Hall/CRC Computational Science, Ch. 19, Edited by E. Wes Bethel and Hank Childs (LBNL) and Charles Hansen (UofU), Chapman and Hall/CRC, 2012. The ViSUS software framework was designed with the primary philosophy that the visualization of massive data need not be tied to specialized hardware or infrastructure. In other words, a visualization environment for large data can be designed to be lightweight, highly scalable and run on a variety of plat- forms or hardware. Moreover, if designed generally such an infrastructure can have a wide variety of applications, all from the same code base. Figure 19.1 details example applications and the major components of the ViSUS infrastructure. The components can be grouped into three major categories. First, a lightweight and fast out-of-core data management framework using multi- resolution space filling curves. This allows the organization of information in an order that exploits the cache hierarchies of any modern data storage architectures. Second, a data flow framework that allows data to be processed during movement. Processing massive datasets in their entirety would be a long and expensive operation which hinders interactive exploration. By designing new algorithms to fit within this framework, data can be processed as it moves. Third, a portable visualization layer which was designed to scale from mobile devices to powerwall displays with same code base. In this chapter we will describe the ViSUS infrastructure, as well as give practical examples of its use in real world applications. B. Summa, J. Tierny, V. Pascucci. 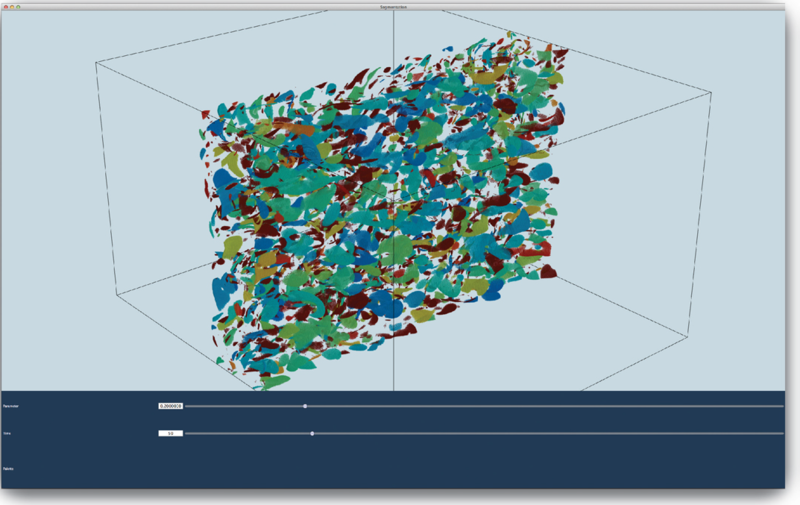 Panorama weaving: fast and flexible seam processing, In ACM Trans. Graph., Vol. 31, No. 4, Note: ACM ID:2335434, ACM, New York, NY, USA pp. 83:1--83:11. July, 2012. A fundamental step in stitching several pictures to form a larger mosaic is the computation of boundary seams that minimize the visual artifacts in the transition between images. Current seam computation algorithms use optimization methods that may be slow, sequential, memory intensive, and prone to finding suboptimal solutions related to local minima of the chosen energy function. Moreover, even when these techniques perform well, their solution may not be perceptually ideal (or even good). Such an inflexible approach does not allow the possibility of user-based improvement. This paper introduces the Panorama Weaving technique for seam creation and editing in an image mosaic. First, Panorama Weaving provides a procedure to create boundaries for panoramas that is fast, has low memory requirements and is easy to parallelize. This technique often produces seams with lower energy than the competing global technique. Second, it provides the first interactive technique for the exploration of the seam solution space. This powerful editing capability allows the user to automatically extract energy minimizing seams given a sparse set of constraints. With a variety of empirical results, we show how Panorama Weaving allows the computation and editing of a wide range of digital panoramas including unstructured configurations. J. Tierny, V. Pascucci. 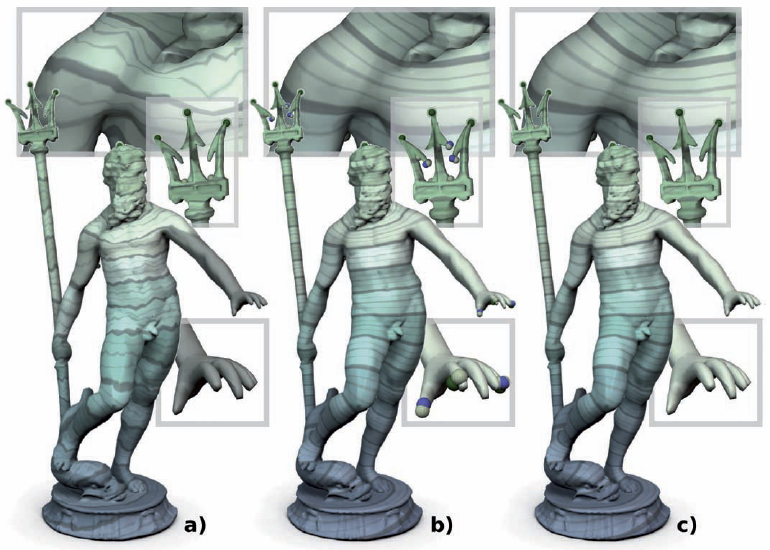 Generalized Topological Simplification of Scalar Fields on Surfaces, In IEEE Transactions on Visualization and Computer Graphics (TVCG), Vol. 18, No. 12, pp. 2005--2013. Dec, 2012. 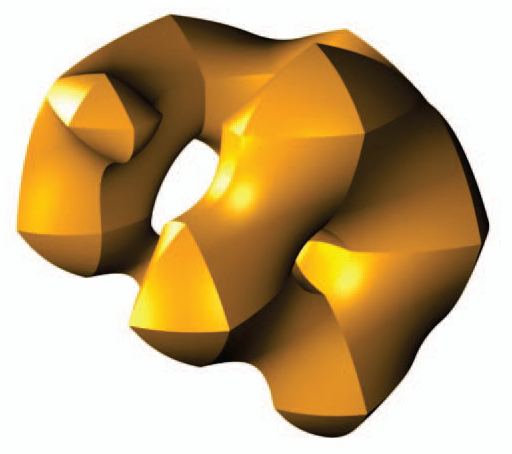 We present a combinatorial algorithm for the general topological simplification of scalar fields on surfaces. Given a scalar field f, our algorithm generates a simplified field g that provably admits only critical points from a constrained subset of the singularities of f, while guaranteeing a small distance ||f - g||∞ for data-fitting purpose. In contrast to previous algorithms, our approach is oblivious to the strategy used for selecting features of interest and allows critical points to be removed arbitrarily. When topological persistence is used to select the features of interest, our algorithm produces a standard ϵ-simplification. Our approach is based on a new iterative algorithm for the constrained reconstruction of sub- and sur-level sets. Extensive experiments show that the number of iterations required for our algorithm to converge is rarely greater than 2 and never greater than 5, yielding O(n log(n)) practical time performances. The algorithm handles triangulated surfaces with or without boundary and is robust to the presence of multi-saddles in the input. It is simple to implement, fast in practice and more general than previous techniques. Practically, our approach allows a user to arbitrarily simplify the topology of an input function and robustly generate the corresponding simplified function. An appealing application area of our algorithm is in scalar field design since it enables, without any threshold parameter, the robust pruning of topological noise as selected by the user. This is needed for example to get rid of inaccuracies introduced by numerical solvers, thereby providing topological guarantees needed for certified geometry processing. Experiments show this ability to eliminate numerical noise as well as validate the time efficiency and accuracy of our algorithm. We provide a lightweight C++ implementation as supplemental material that can be used for topological cleaning on surface meshes. W. Widanagamaachchi, C. Christensen, P.-T. Bremer, V. Pascucci. Interactive Exploration of Large-scale Time-varying Data using Dynamic Tracking Graphs, In 2012 IEEE Symposium on Large Data Analysis and Visualization (LDAV), pp. 9--17. 2012. Exploring and analyzing the temporal evolution of features in large-scale time-varying datasets is a common problem in many areas of science and engineering. One natural representation of such data is tracking graphs, i.e., constrained graph layouts that use one spatial dimension to indicate time and show the “tracks” of each feature as it evolves, merges or disappears. However, for practical data sets creating the corresponding optimal graph layouts that minimize the number of intersections can take hours to compute with existing techniques. Furthermore, the resulting graphs are often unmanageably large and complex even with an ideal layout. Finally, due to the cost of the layout, changing the feature definition, e.g. by changing an iso-value, or analyzing properly adjusted sub-graphs is infeasible. 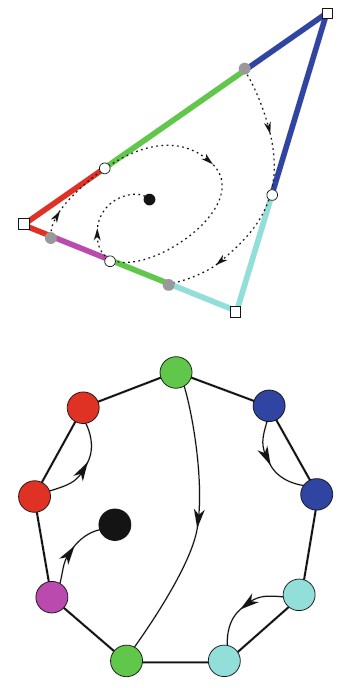 To address these challenges, this paper presents a new framework that couples hierarchical feature definitions with progressive graph layout algorithms to provide an interactive exploration of dynamically constructed tracking graphs. Our system enables users to change feature definitions on-the-fly and filter features using arbitrary attributes while providing an interactive view of the resulting tracking graphs. Furthermore, the graph display is integrated into a linked view system that provides a traditional 3D view of the current set of features and allows a cross-linked selection to enable a fully flexible spatio-temporal exploration of data. 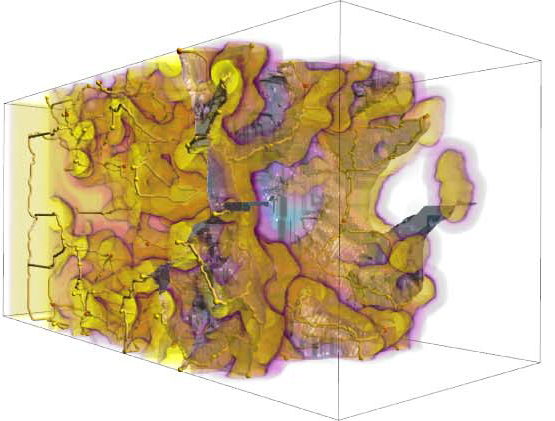 We demonstrate the utility of our approach with several large-scale scientific simulations from combustion science. P.C. Wong, H. Shen, V. Pascucci. Extreme-Scale Visual Analytics, In IEEE Computer Graphics and Applications, Vol. 32, No. 4, pp. 23--25. 2012. Extreme-scale visual analytics (VA) is about applying VA to extreme-scale data. The articles in this special issue examine advances related to extreme-scale VA problems, their analytical and computational challenges, and their real-world applications. S. Ahern, A. Shoshani, K.L. Ma, A. Choudhary, T. Critchlow, S. Klasky, V. Pascucci. Scientific Discovery at the Exascale: Report from the (DOE) (ASCR) 2011 Workshop on Exascale Data Management, Analysis, and Visualization, Note: Office of Scientific and Technical Information (OSTI), January, 2011. J.C. Bennett, V. Krishnamoorthy, S. Liu, R.W. Grout, E.R. Hawkes, J.H. Chen, J. Shepherd, V. Pascucci, P.-T. Bremer. Feature-Based Statistical Analysis of Combustion Simulation Data, In IEEE Transactions on Visualization and Computer Graphics, Proceedings of the 2011 IEEE Visualization Conference, Vol. 17, No. 12, pp. 1822--1831. 2011. H. Bhatia, S. Jadhav, P.-T. Bremer, G. Chen, J.A. Levine, L.G. Nonato, V. Pascucci. Edge Maps: Representing Flow with Bounded Error, In Proceedings of IEEE Pacific Visualization Symposium 2011, Hong Kong, China, Note: Won Best Paper Award!, pp. 75--82. March, 2011. H. Bhatia, S. Jadhav, P.-T. Bremer, G. Chen, J.A. Levine, L.G. Nonato, V. Pascucci. 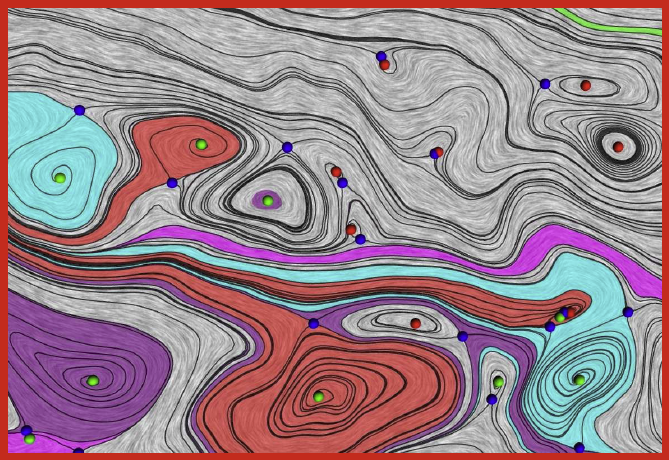 Flow Visualization with Quantified Spatial and Temporal Errors using Edge Maps, In IEEE Transactions on Visualization and Computer Graphics (TVCG), Vol. 18, No. 9, IEEE Society, pp. 1383--1396. 2011. A. Cuadros-Vargas, L.G. Nonato, V. Pascucci. Combinatorial Laplacian Image Cloning, In Proceedings of XXIV Sibgrapi – Conference on Graphics, Patterns and Images, pp. 236--241. 2011. Seamless image cloning has become one of the most important editing operation for photomontage. 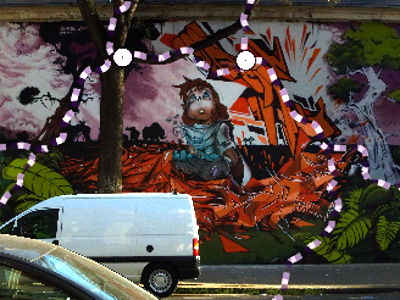 Recent coordinate-based methods have lessened considerably the computational cost of image cloning, thus enabling interactive applications. However, those techniques still bear severe limitations as to concavities and dynamic shape deformation. In this paper we present novel methodology for image cloning that turns out to be highly efficient in terms of computational times while still being more flexible than existing techniques. Our approach builds on combinatorial Laplacian and fast Cholesky factorization to ensure interactive image manipulation, handling holes, concavities, and dynamic deformations during the cloning process. The provided experimental results show that the proposed technique outperforms existing methods in requisites such as accuracy and flexibility. T. Etiene, L.G. Nonato, C. Scheidegger, J. Tierny, T.J. Peters, V. Pascucci, R.M. Kirby, C.T. Silva. Topology Verfication for Isosurface Extraction, In IEEE Transactions on Visualization and Computer Graphics, pp. (accepted). 2011. The broad goals of verifiable visualization rely on correct algorithmic implementations. 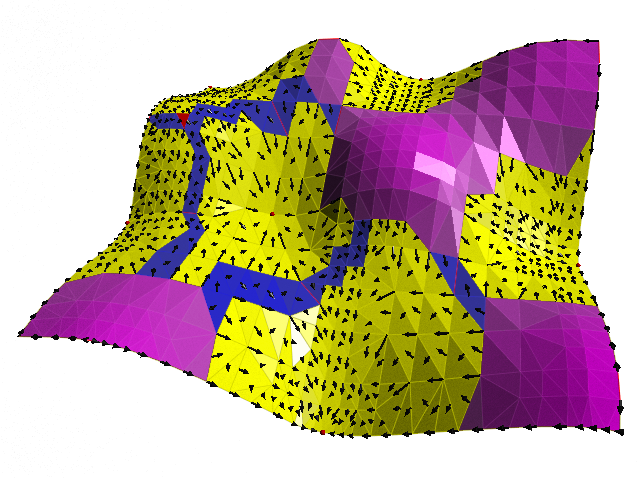 We extend a framework for verification of isosurfacing implementations to check topological properties. Specifically, we use stratified Morse theory and digital topology to design algorithms which verify topological invariants. Our extended framework reveals unexpected behavior and coding mistakes in popular publicly-available isosurface codes. Attila Gyulassy, J.A. Levine, V. Pascucci. Visualization of Discrete Gradient Construction (Multimedia submission), In Proceedings of the 27th Symposium on Computational Geometry, Paris, France, ACM, pp. 289--290. June, 2011. This video presents a visualization of a recent algorithm to compute discrete gradient fields on regular cell complexes . Discrete gradient fields are used in practical methods that robustly translate smooth Morse theory to combinatorial domains. We describe the stages of the algorithm, highlighting both its simplicity and generality. S. Jadhav, H. Bhatia, P.-T. Bremer, J.A. Levine, L.G. Nonato, V. Pascucci. Consistent Approximation of Local Flow Behavior for 2D Vector Fields, In Mathematics and Visualization, Springer, pp. 141--159. Nov, 2011. Typically, vector fields are stored as a set of sample vectors at discrete locations. Vector values at unsampled points are defined by interpolating some subset of the known sample values. In this work, we consider two-dimensional domains represented as triangular meshes with samples at all vertices, and vector values on the interior of each triangle are computed by piecewise linear interpolation. Many of the commonly used techniques for studying properties of the vector field require integration techniques that are prone to inconsistent results. Analysis based on such inconsistent results may lead to incorrect conclusions about the data. For example, vector field visualization techniques integrate the paths of massless particles (streamlines) in the flow or advect a texture using line integral convolution (LIC). Techniques like computation of the topological skeleton of a vector field, require integrating separatrices, which are streamlines that asymptotically bound regions where the flow behaves differently. Since these integrations may lead to compound numerical errors, the computed streamlines may intersect, violating some of their fundamental properties such as being pairwise disjoint. Detecting these computational artifacts to allow further analysis to proceed normally remains a significant challenge.